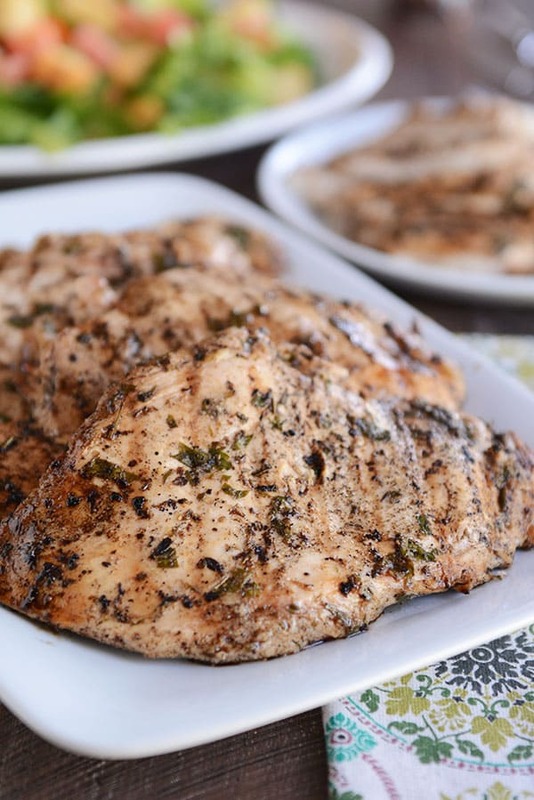 This deliciously easy grilled sesame herb chicken (using every day ingredients!) has a hint of Middle Eastern flavors that make it unique and extra tasty! I have this problem where I think I’m about 20 years younger than I really am and I stay up waaaaay too late. Like, way too late. I’m not pulling all-nighters to do fun stuff like paint my toenails and chat with friends and watch Netflix. No, it’s like procrastination at it’s finest. I’m up half the night doing frantic blog-work stuff (editing pictures of Oreo cookies at 1 a.m. is a really bad idea, BTW), because I can’t pull myself away from sitting on the back deck during the dreamy evening hours watching my kids play one-base baseball to tackle other pressing matters. And I’m not trying to sound like mother of the year (if I was, I’d be actually playing baseball with them), because I’m so not that. I just feel like summer, in which the summer Olympics have not helped me at all, has just trashed my time management skills. That, and already insane soccer practice schedules (I feel a nervous twitch coming on just talking about it). I just wish this old body could handle the lack of sleep like it used to. What does all this have to do with grilled sesame chicken? Well, I’m so glad you asked! If you are lacking quick-firing brain cells and need a no-fuss dinner that can easily be pulled together no matter the amount of sleep you’ve had, this one’s for you. With a simple, delicious Middle Eastern flair, this grilled sesame herb chicken is crazy good and so, so easy! 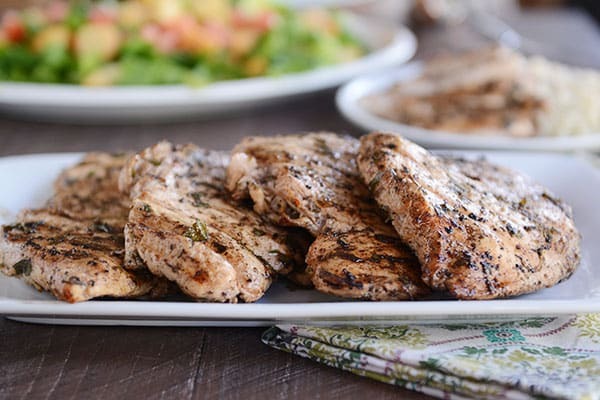 What makes it a little extra-special and tasty, aside from the notable flavors which I’ll talk about in a sec, is a quick step to pound the chicken breasts into thinner, even cutlets. It might seem like an unnecessary step, but don’t skip it (unless you are going to live on the edge and make kabobs out of the meat, of course)! The thinner pieces of meat soak up the flavor of the marinade so that each bite is packed with incredible deliciousness. 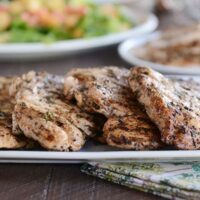 I’ve included an alternate method if you are adamantly opposed to pounding chicken, so read through the recipe (don’t worry, I’m sure you are not alone in the pounding chicken aversion). 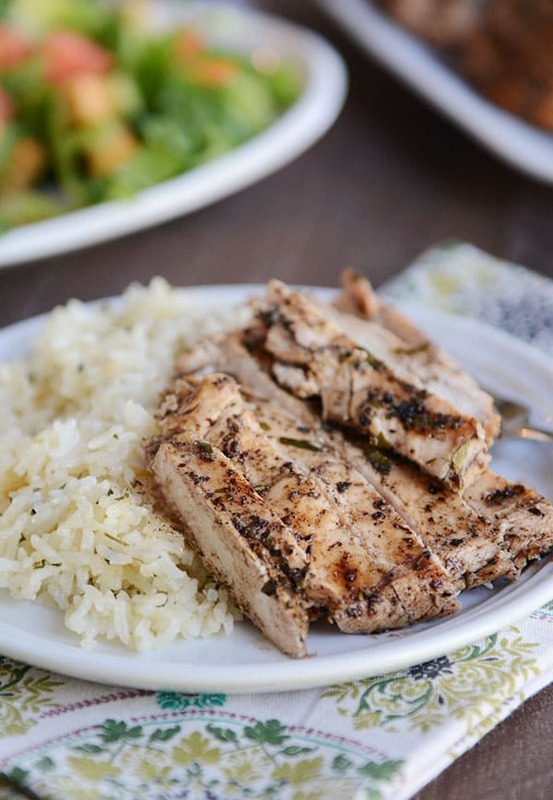 I served this amazing grilled chicken with cilantro lime rice and a green salad. I’m thinking it would be wonderful in a pita wrap or served with a side dish of of lemon rice or black beans? I don’t know. The options seem limitless. I ate the leftover chicken on top of a lunchtime salad with a little touch of blue cheese vinaigrette and about died, it was so delicious. This grilled sesame herb chicken reminded me yet again that so often simple flavors are the best. The citrusy marinade is loaded with herbs – both fresh and dried. The flavors are perfection, and the hint of sesame oil is probably my favorite part of the whole thing. It’s a very liberal take on the flavors of za’atar (a Middle Eastern spice blend). If you actually have za’atar in your pantry, try subbing an equal amount for all the dried herbs in the recipe. 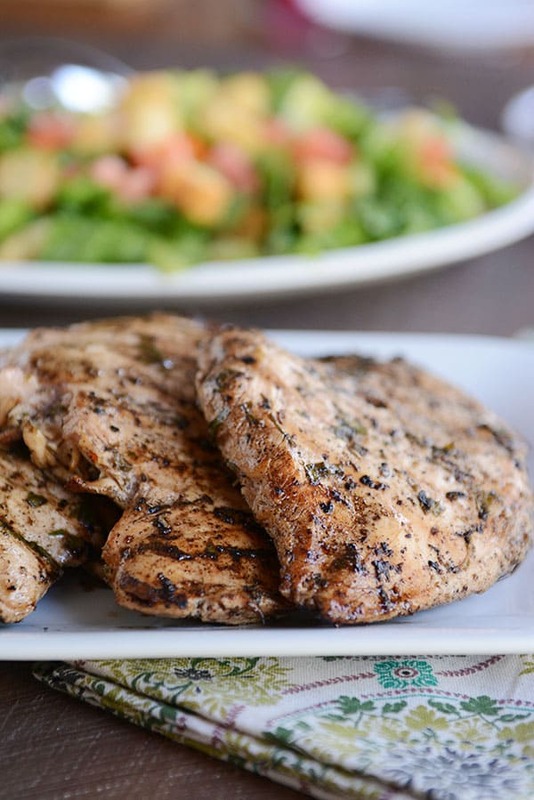 I hope you love this delicious grilled chicken as much as we do! Pound each piece of chicken to an even thickness of 1/4- to 1/2-inch thick. I do this by placing each chicken breast one-by-one in a freezer ziploc bag (since the plastic is thicker than a regular storage bag), leaving the bag open to let air out, and pounding with the smooth end of my meat mallet or the bottom of a heavy skillet. ALTERNATE METHOD: If the chicken breasts you are using are really thick, you can cut them in half (like a hamburger bun) to form two thinner cutlets. Whisk together all the marinade ingredients: parsley, lemon juice, red wine vinegar, sesame oil, olive oil, garlic cloves, marjoram, thyme, oregano, salt and pepper. Place the chicken in a baking dish or ziploc bag and pour the marinade over the top. Turn to coat the chicken in the marinade. Refrigerate for at least 30 minutes and up to 2 hours (any longer and the acidity in the marinade can "cook" the chicken and turn it white). Preheat a grill to medium. Grill the chicken until cooked through and an instant-read thermometer reads 165 degrees F, about 3-4 minutes per side, depending on the thickness of the chicken. Let the chicken rest, covered, for 5-10 minutes before slicing into strips and serving. This chicken is an adaptation from a za'atar chicken recipe (which is a Mediterranean spice blend made up of sesame, thyme, marjoram and sumac). If you don't have marjoram in your spice cabinet, you can try using another dried herb (maybe basil or a little more thyme and oregano?). Obviously it will change the flavor just a bit but since this isn't necessarily a 100% authentic za'atar recipe, I think it will be just fine (although it is delicious with the marjoram). This is a favorite. I bought the Zatar seasoning. Did not realize you prefer the individual spices. Have to give that a try. Sometimes I marinade overnight because of time constraints. P. S. Thanks for the recipe, Mel. This stuff is GOOD. And it’s easy to make. I pounded the chicken until it was 1/2 inch thick and then cooked it on a George Foreman Grill for 3 1/2 minutes. This looks SO delicious! Looks like I’ll need to hit the grocery store again–I’m going to need a Lot of lemons this week! I have all the spices listed separately in the recipe, but I also have Za’atar. If you’ve made this both ways, which have you most preferred? I actually prefer the individual spices, but really it’s not a significant difference in flavor either way. This is divine! I love making extra, refridgerating it, and thinly slicing the chicken to put on top of our salad the next night (ceasar is my favorite!). You could try either – I’m sure it will still taste great! Made this last night. SO. GOOD. Like, after taking the chicken out of the marinade and grilling it, I tasted the finished product and quickly threw some more uncooked chicken breasts in my remaining marinade to start another batch. This is a keeper! Made this for dinner on Sunday and it a winner (of course!). Thanks for another great recipe! Seriously on the body-not-being-able-to-handle-lack-of-sleep-anymore thing! I’ve been thinking the same thing like how the heck did I stay up till like midnight (and probably later sometimes) and get up for a 4 am custodial job in college? I remember being tired (and evil-eyeing my roommate/coworker for keeping me up late and she would just give me the evil eye right back), but not like penetrating my whole head and brain tired like I feel now. I’m getting old! I know! Isn’t it crazy how that changes? THIS. WAS. DELICIOUS!! Thank you Mel!! Yay! Thanks for trying it so quickly! Tried it as kabobs tonight. MMMMMMM!!!!!!! With a capital M. Thanks Mel! Kabobs!! So happy they worked out! Could you use sumac in this? I spent a few weeks in the Middle East this spring and brought a bunch of it home. Yes! I didn’t use it or include it in the recipe because it’s hard to find but would make it even more authentic and delicious. This looks so good! I always love a good marinade to mix up our typical poultry dining 🙂 Will have to try very soon! Hey it’s the end of summer and things are at a semi standstill around here. Schedules returning soon. Hang in there!